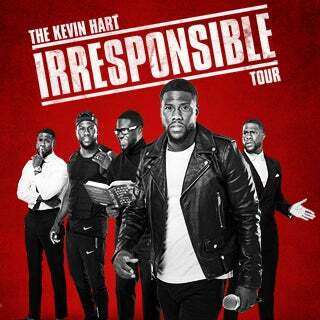 LOS ANGELES (Jan 29, 2018) – Today, Kevin Hart announced he is expanding his widely successful and massively hysterical ‘The Kevin Hart Irresponsible Tour,’ adding over 100 new dates across the U.S., Canada, Europe, Australia and Asia. Produced by Live Nation, the new dates will kick off March 23 in Baltimore and hit all new cities including New York, Atlanta, Chicago, Toronto, Paris, London, Sydney, Auckland, Singapore, and more. See below for full routing and on sale details. Tickets for the newly added North American dates are on sale to the general public now at LiveNation.com. Tickets for the Nov. 1 show at the AT&T Center in San Antonio will also be available at Ticketmaster.com, ATTCenter.com, and 800-745-3000.